Mrs. Robert C. Navarre, Ironville, Oh., 28 Aug 1899, computer scan of Marriage Certificate, Civil War Pension Widow's application #704723 cert #48634, filed 25 May 1899, National Archives, Washington, DC. I Hereby Certify, That on the 8th day of December , A. D. 189 60 , I solemnized the MARRIAGE CONTRACT between Robert Navarre and Lucinda Ankeny [sic] by authority of a License from Probate Court within and for said County. M. Mc. Kissick, J. P.
I, Irwin I. Millard, Judge and Ex-officio Clerk of the Probate Court of Lucas County, State of Ohio, do hereby certify the foregoing to be a true and correct copy taken from the original papers on file and of record in said Court. Witness my hand and seal of said Court this 28th day of August A. D. 1899. Robert C. Navarre, Ironville, Oh., to Hon. J. C. Black, Pension Commissioner, Washington, D.C., 21 December 1885, Xerox of LS, War of 1812 Widow's Pension application #20456 (Mary Ann widow of Alexis Navarre), National Archives, Washington, DC. I am requested to write you by my Aunt Maryann Navarre, widow to the late Alexander Navarre of the War of 1812, in regard to her pension. She cliams claims to have made application 7 or 8 years ago, and things seem to be no farther ahead than when she began, her attorney Mr. Fairghson [A. Farquharson] tells her that it will be all right but she has got tired of waiting. Pleas if you can give her any information in regard to it you will oblige her very much. Military Record <http://data.ancestry.com/>. Discharged April 17, 1865. Robert C. Navarre. Toledo Public Library, Local History & Genealogy. ]: Picture File--Portraits (with note on back). Born December [not September as Denissen has] 3rd 1830 in the North West Territory, Monroe Town. Now the State of Michigan. Moved from the above State and Town, april 4th 1840. To the mouth of Maumee River Manhattan Township County of Lucas State of Ohio. Voted in the Township of Manhattan and the Township of Oregon, and the City of Toledo, same County ever since 1851. Never lost [i.e. missed] a vote, voted first time for Gen. Winfield Scott for President of the U.S.A.
Wright, Isaac. The East Side: Early History of East Toledo up to 1894. Toledo, Ohio: The Second Congregational Church, 1884. Probably the largest haul of fish ever taken out of Maumee bay, or Lake Erie, was made by Mr. Robert Navarre, the vetran range light keeper of Ironville. This haul was made in March, 1858, and was made with an eighty-rod seine. The three hauls resulted as follows: first, 50 barrels; second, 42 barrels; and third, 22 barrels, 114 barrels in all, weighing 250 pounds to the barrel. This was over 14 tons of fish, which were selling for 3 cents per pound, netting Mr. Navarre $950. Mr. Robert C. Navarre moved from Monroe to Presque Isle in 1840. His early life was spent in farming, hunting and acting as agent for fur buyers. On the breaking out of the war Mr. Navarre enlisted--begin page 76--in the 100th Ohio, served three years and was twice severely wounded. In 1868 he was appointed keeper of the light station at the mouth of the Maumee, which position he holds at present. Navarre, Robt. C., Co. E, 100th O. V. I.
Navarre, Jas. P., Co. L, 2d O. H. Art. Navarre, Lambert, Co. L. 2d O. H. Art. Navarre, Toussant, Co. A, 130th O. V. I.
Navarre, David, Co. H, 2d O. H. Art. Navarre, Isadore, Co. D, 100th, O. V. I. 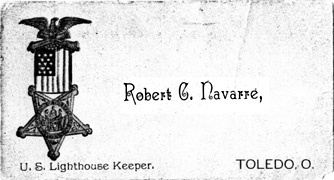 Probably the oldest settler now living in Ironville is Robert Navarre, keeper of the range lights, and son of Robert Navarre, the scout of Gen. Harrison. Mr. Navarre came on this side of the river from Monroe, in April, 1840, and has had charge of the range lights since September, 1868. Mr. Navarre served three years in the 100th O. V. I., and received two severe wounds in the service of his country. St. Louis Church, 447 Sixth street; built 1871, dedicated 1872. The following priests have officiated at this church: Rev. Fr. Yeager, Rev. Fr. Gauthier, Rev. Fr. Rouchy, Rev. Fr. Thein, Rev. Fr. Premeau, Rev. Fr. Smith, Rev. Fr. Berger. The following gentlemen were elected the first church council: Louis Metzger, Joseph Gladeaux, Henry Masey, Louis Gelin, Robert Navarre, Louis Montville, Anthony Barror, Sr., Thomas Meyers, Andrew Metzger, Sr., Thebeau Bihl, Victor Gladeaux, Jacob Dupont, Sr., Sirile Plumey, treasurer; Frank Bardey, secretary. Denissen, Christian. Genealogy of the French Families of the Detroit River Region Revision 1701-1936. Ed. Harold Powell. Detroit: Detroit Society for Genealogical Research, 1987. 14. ROBERT4 NAVARRE (Robert3 Robert2 Robert1) b Sep 1809 St Antoine River Raisin m. CATHERINE GAILLARD, b there 5 Oct 1814 dau of Joseph Gaillard and Mary Margaret Bourg. In spring of 1840 Robert and family moved to Presque Île at Maumée River four miles north of Toledo, OH. Fassett, Josephine. History of Oregon and Jerusalem: The Story of Two Communities. Camden, Arkansas: The Hurley Company, Inc, 1961. Robert T. and his wife, Catherine Guyor [Gaillard] Navarre came form St. Antoine, Michigan near Monroe in 1840. They had a family of seventeen children which included the following. 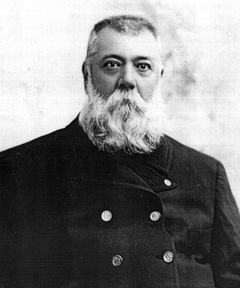 Robert C. Navarre who was born in Michigan on December 3, 1830. He enlisted in the 100th OVI in the Civil War. He was wounded twice. After being wounded the second time he was discharged because of disability. He married Lucinda Jane Ankeney and settled in Manhattan Township (later annexed to Oregon). He was a farmer and fur trader. He served as trustee for four years, clerk 2 years and constable 3 years. His daughter, Alice was born October 8, 2862. She married Phillip Garrigan and they had a son Robert. Alice was a member of the first auxiliary of the G.A.R. Ladies. Her father, Robert C., was employed as lighthouse keeper in 1868 and continued to serve in thiscapacity the remainder of his life.